Over the past year, CatalystOne has been working in parallel on a complete overhaul of the corporate brand, as well as the user interface in their HCM software suite. “Motivated by the goal of creating a superior end-to-end user experience, we have gone to great lengths in this total rebranding process. We realised that after 15 years, our company’s brand identity and the user interface in our software didn't reflect who we have become as a company and software vendor", says Hope Mears Østgaard, VP Marketing. "CatalystOne is all about people - for people and by people – and this has been our mantra throughout the project, both when working with the user experience in our software suite and our overall brand experience." "This rebranding is an important part of our growth strategy, and how we develop the company to take on bigger challenges - both in the Nordic market and increasingly looking towards other European market opportunities", says Avtar S. Jasser, CEO. "Over the past couple of years we have on average grown our organisation in the Nordics and India by 40% and we have also seen an average 40% increase in revenue. We think that our commitment to creating a unique experience throughout the whole customer journey - which is deeply rooted in our company culture - will differentiate us from our global competitors and further accelerate our growth". 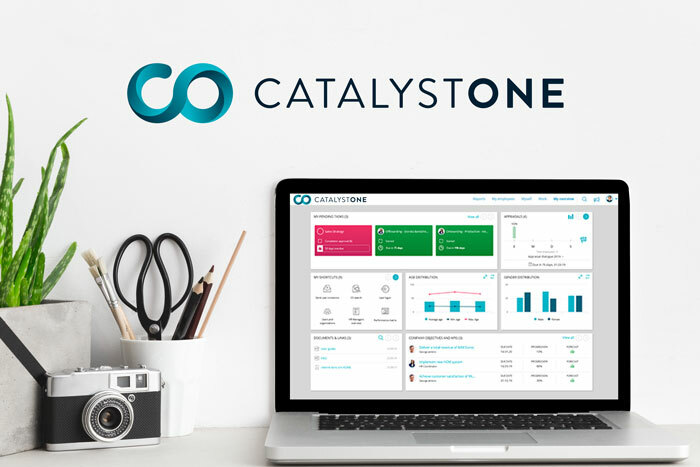 CatalystOne Solutions is a fast-growing SaaS company that specialises in software and services for digitalising HR processes and enabling positive relations between HR, employees, and managers. We are the Nordic leader within HCM (Human Capital Management) software and provide user-friendly solutions for processes such as HR master data, performance management, talent management, and learning management. We work closely with our customers to ensure maximum value and support - passion for our customers’ success is in our DNA. We have offices in Stockholm, Oslo, Copenhagen, Sandefjord, and an R&D centre in Chandigarh, India. Our team consists of some 200 HCM professionals.